Holiday Inn & Suites Makati invites couples, families and their little ones to celebrate Easter with a relaxing and enjoyable staycation! From April 12 to April 21 (Easter Sunday), book a deluxe room for only P5,900++ inclusive of buffet breakfast for 2 at Flavors Restaurant, one ticket to the Easter Sunday activity for your child and a guaranteed late check out at 3pm. Better yet, if you want to extend an extra night, Holiday Inn & Suites Makati offers a special room only rate of P4,000++. Let your children enjoy Easter Sunday with a fun-filled activity that will challenge their minds and physical agility. Kids aged 6 to 12 are invited to help Sherlock Grinn hunt for the Golden Eggs that are hidden within Holiday Inn & Suites Makati. Kids will unlock riddles and accomplish challenges to receive clues to where the golden eggs are. Tickets are at P1,000 nett each, inclusive of a loot bag, morning snacks, games and chances to win fabulous prizes. Easter Sunday is not complete without an Easter Sunday Brunch. 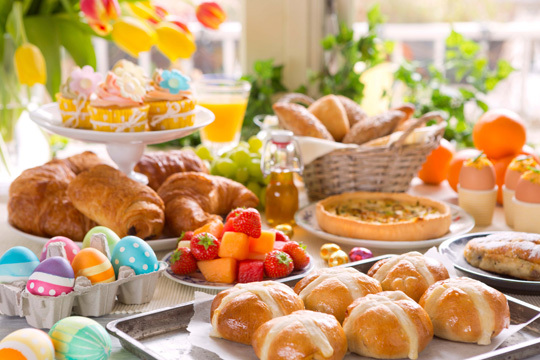 Take the whole family and enjoy a scrumptious Sunday brunch fit to celebrate the risen King. Dig into breakfast favorites and delight in the succulent US rib-eye roast and the savory Flavors Lechon. Round off your meal with heavenly Easter-themed desserts and Holiday Inn’s award-winning ube cheesecake and crepe samurai. Easter Sunday brunch comes with two glasses of Sparkling wine for only P2050 nett.